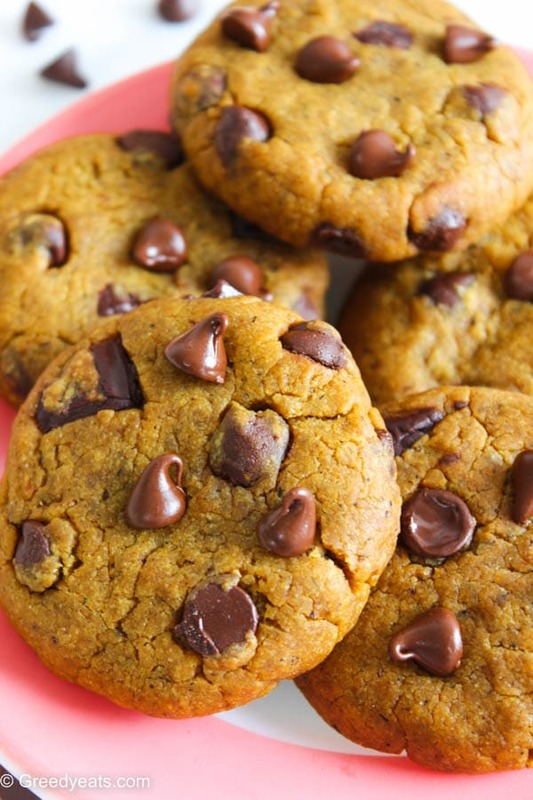 Easy pumpkin chocolate chip cookies, a small batch recipe to bake this fall. So chewy, insanely thick, super soft and not cakey at all! Although it’s 90 degrees F outside, but in my head I am in the fall state of mind. Dreaming about picking apples, carving pumpkins, wearing knitted socks, cozy boots and making pretty pies! I love fall more than I love these! 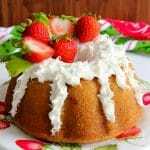 Super moist and fluffy strawberry bundt cake with a thick, flavor packed and pretty strawberry swirl hidden inside! Another strawberry bundt cake recipe before we officially welcome fall! Need to put as many strawberries in our cakes as we can. Can’t believe summer is almost ready to wrap itself up! I can already feel fall in the chill of air. It’s gonna be pumpkin time soon again! Yay!!! Tell me you too are a heavy pumpkin eater baker. Heavier than the largest pumpkin ever known! What? Are you not??? If you ask me about how I adore pumpkins. I baked and shot 5 pumpkin recipes in a matter of two short days. Told ya, I love pumpkins!!! Okay but first, strawberry bundt cake. 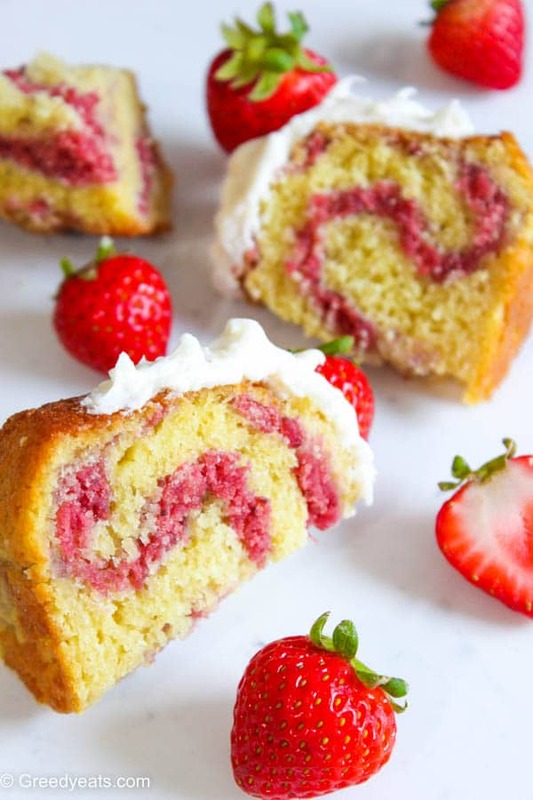 More specifically strawberry S-w-I-r-L-e-D bundt cake. Thick, sweet strawberry flavored swirl hiding inside a buttery, fluffy and not so dense bundt cake! Oh-so-delicious. My mouth is already watering! Did you check that swirl out? So neat, swirly and full of juicy strawberry flavor! It didn’t come out like this at all in my first try. 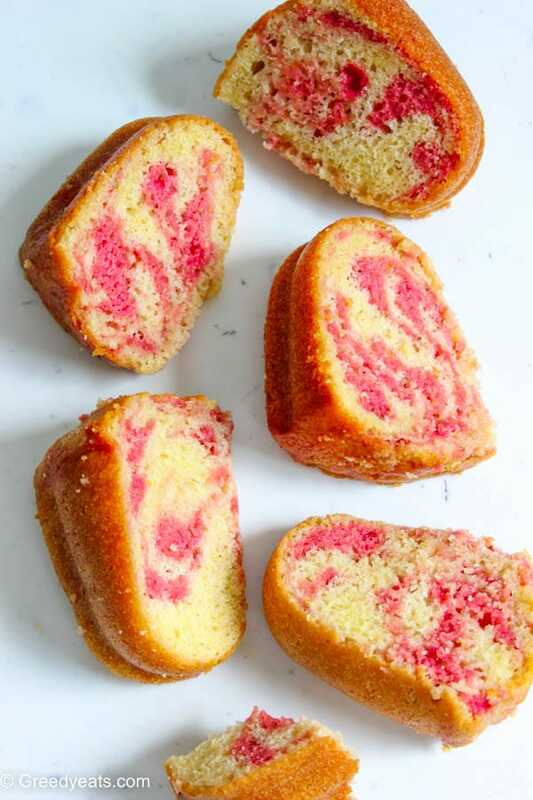 I desired maximum strawberry flavor and numerous swirls like this in my cake. Now is it too much to ask for? And in my quest I ended up using more strawberry batter swirls in that first try. But I could not stop here. I mean how could I! I only wanted that thick perfect strawberry swirl of my dreams. Without any compro on the flavor of-course! And finally poured the remaining vanilla batter. And bake. Believe me it is really this easy! Speaking of which you don’t even need to cream your butter and sugar. Super heavy, dense and a ton of creamed butter recipes move aside! 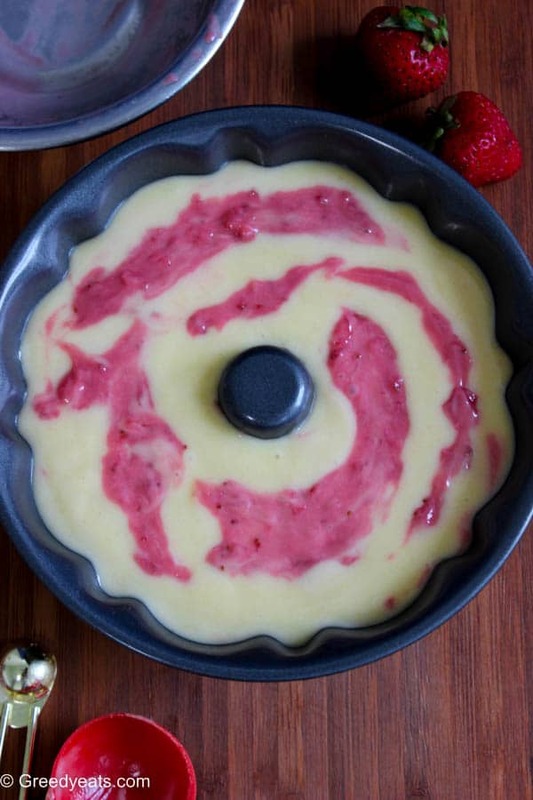 Make room for a light, fluffy, buttery, swirly-twirly and super easy strawberry bundt cake. No mixers required! Did you notice how up it rose? Look up! 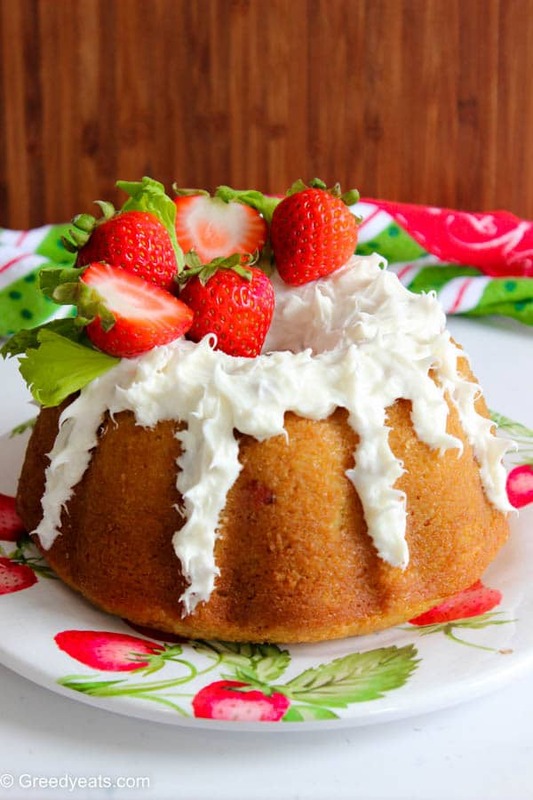 ⇑♥⇑♥⇑ That’s how light this bundt cake is! 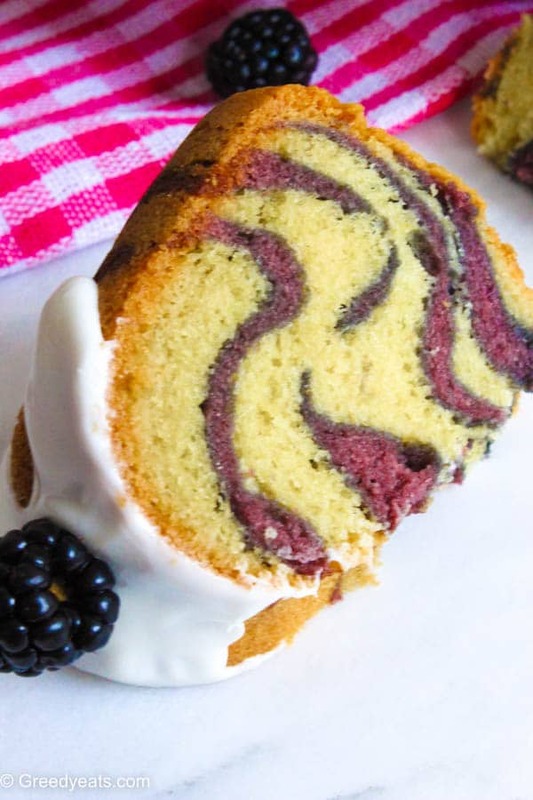 Now if you are looking for a richer, denser and a pound cake like bundt with a ton of pretty swirls try my small batch berry swirled vanilla pound cake instead. Love fruity cakes? 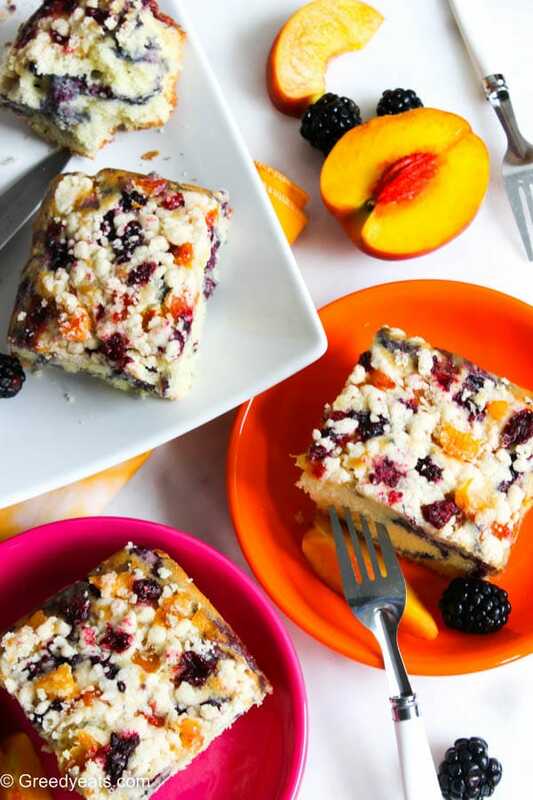 Then trying this readers’ fave peach-berry crumb cake is a must! 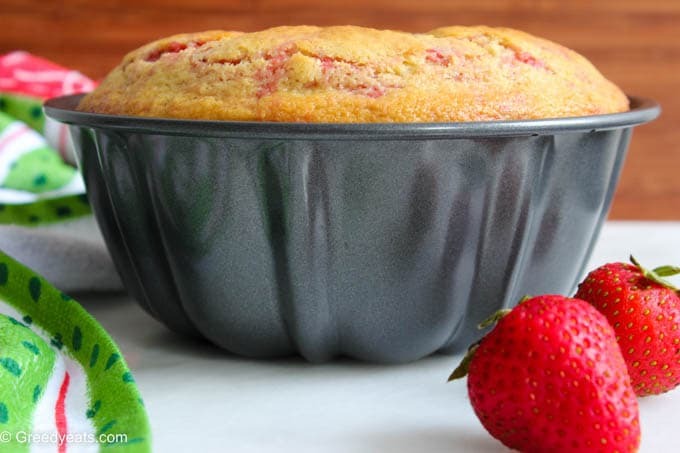 Super moist, buttery and fluffy strawberry bundt cake with a thick, flavor packed and pretty strawberry swirl hidden inside! 1. Preheat your oven to 350°F (177°C) and grease/spray a 6 inches bundt pan with butter/oil. 2. Sift flour, baking soda, baking powder and salt together. Set aside. 3. In a mixing bowl whisk together buttermilk, eggs and sugar till combined. Remember to use everything room temperature only. Now beat in your melted butter, vanilla in the mix. 4. Slowly incorporate all the dry ingredients into wet and fold only till flour dissappears. 5. Take about 3 tablespoons of batter out and add strawberry jam to it. Mix two drops of food coloring (if adding). Layer 1/3 of the vanilla batter first, then a strawberry batter layer, 1/3 of vanilla batter next, all the remaining strawberry batter (as shown in the pic) and finally the remaining vanilla batter. 6. Bake it for about 35-40 minutes. The cake is ready when it passes tooth pick test. Take care not to over bake this one. Cool it for 10-15 minutes in the bundt pan. Cool down further on a wire rack before frosting. I frosted my cake with buttercream to look like a glaze topping. Then I created those little spikes using a tooth-pick. You can frost the cake into your desired patterns. Or cover this cake with a vanilla glaze. So good! This recipe is slightly adapted from the quotable kitchen. 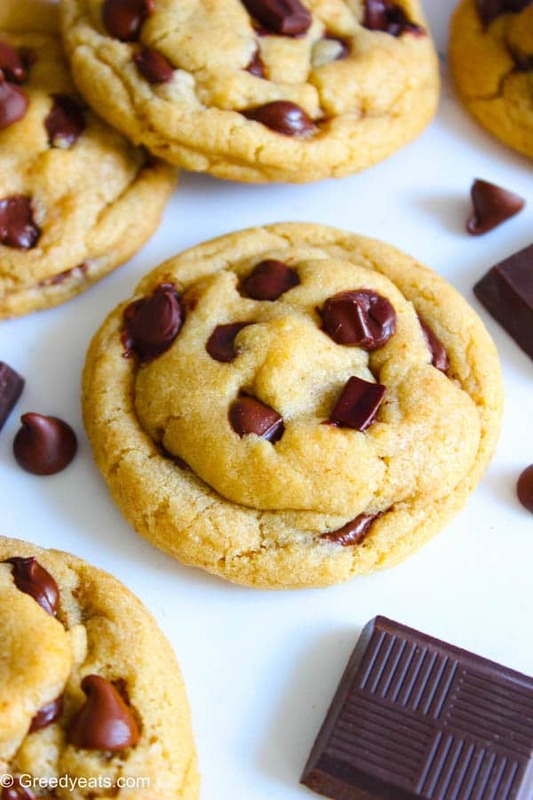 The best vegan chocolate chip cookies you will ever bake. Super thick, so chewy and oozing with pockets of melty chocolate chunks! You will never miss egg in these beauties. Heck, you won’t even know these cookies are vegan! 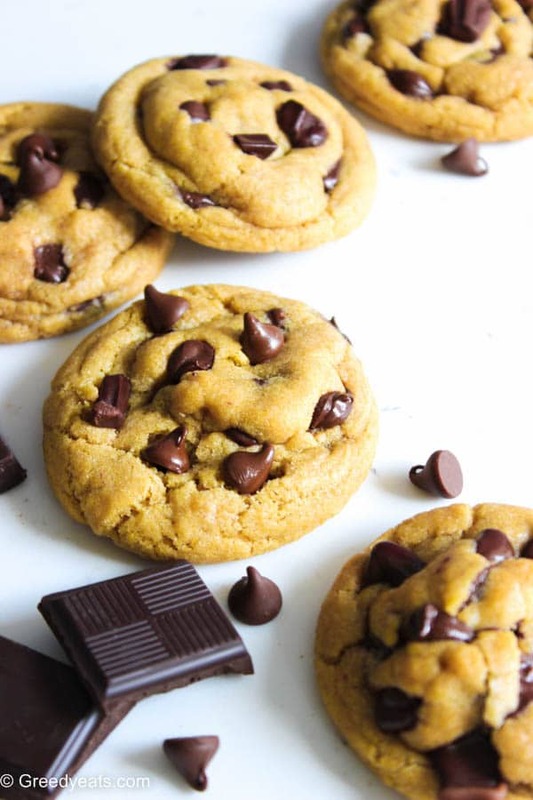 Super chewy and thick enough to put a non-vegan chocolate chip cookie to shame! 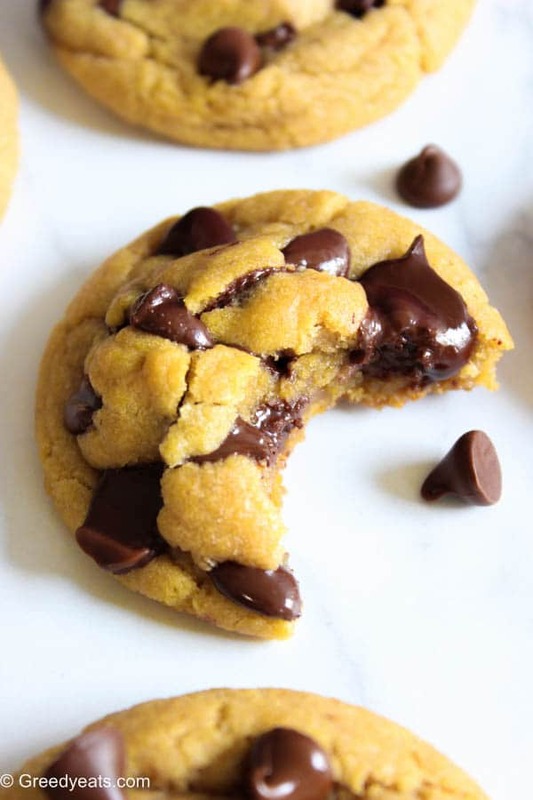 WHY ARE THESE THE BEST CHOCOLATE CHIP COOKIES? a) These cookies contain ZERO processed sugar! That’s the reason they bake ultra soft and chewy. As white sugar is known for sucking out some of the moisture from the baked goods! b) Using just the right amount of flour and a little cornstarch, helps these cookies bake nice and thick. c) We will roll our cookie balls tall rather than wide. This will prevent them from over spreading in the oven, while their centers remain soft and buttery. A soft baked consistency that we all love! d) To ensure a flavor rich cookie, I have added some almond extract along with vanilla. Try it once and I promise there is no going back! e) You don’t need any special equipments for this recipe. Not even a mixer. Since it’s a small batch, you can easily beat that butter with a balloon whisk! f) Your cookie dough does not need to sit in the refrigerator for several hours. A simple 5 minutes chill in the freezer, does the trick! 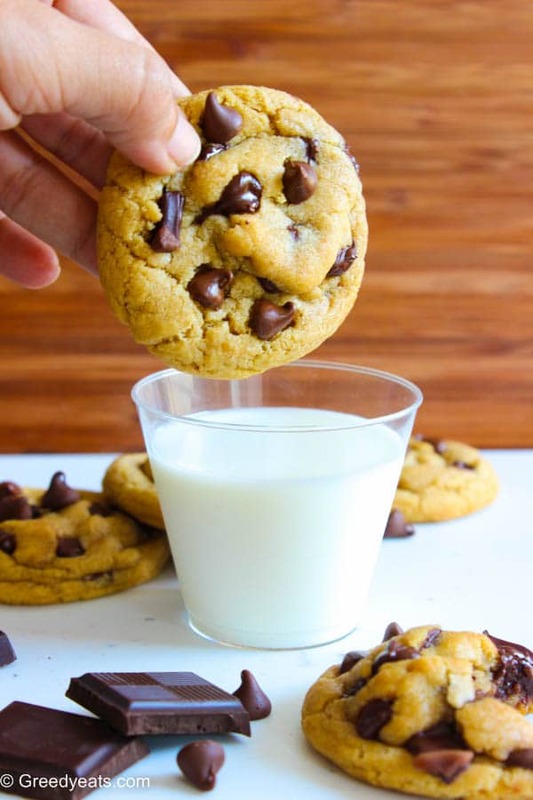 You need nothing but a wide glass of milk to dip these thick, puffy and the best chocolate chip cookies in! What are we substituting for eggs? Flax egg! Flax egg works wonderfully in chocolate chip cookies and you will never taste those seeds in the baked cookies. If grinding your flax seeds at home or somehow you find your flax egg has small bits of seeds visible, strain your flax egg. This step if completely optional if you don’t mind those teeny-tiny bits in your cookies. Either way, you are not going to taste them, with all those fragrant extracts present in our dough. We can’t afford to under beat our butter and sugar. They both form the base of our cookie dough. Beat them till the mix turns fluffy, light and pale in color. Prepare your flax egg prior to start beating the butter. Strain it in the beaten batter if required. Don’t over mix the cookie dough after adding flour. We want them to rise well and bake all puffy! Chill those mounts in the freezer till they are firm to touch. Skipping this step will lead to spread your cookies in the oven. 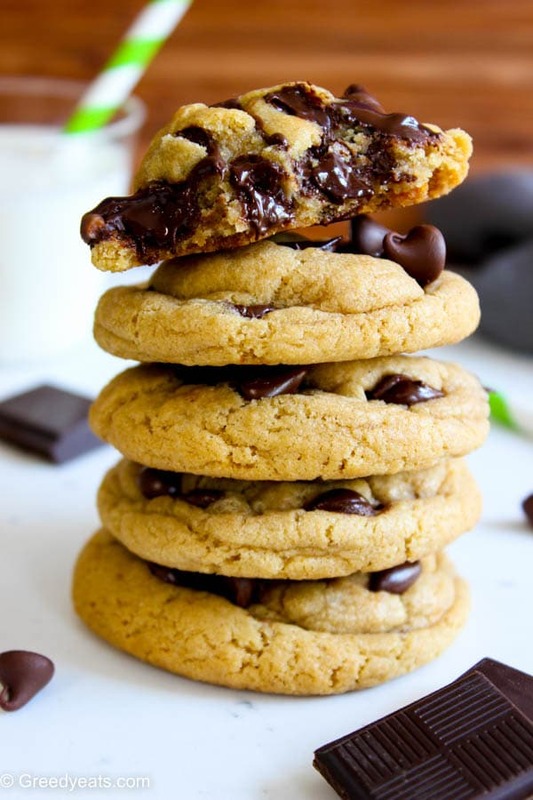 Don’t over stuff your cookies with chocolate or chocolate chips. 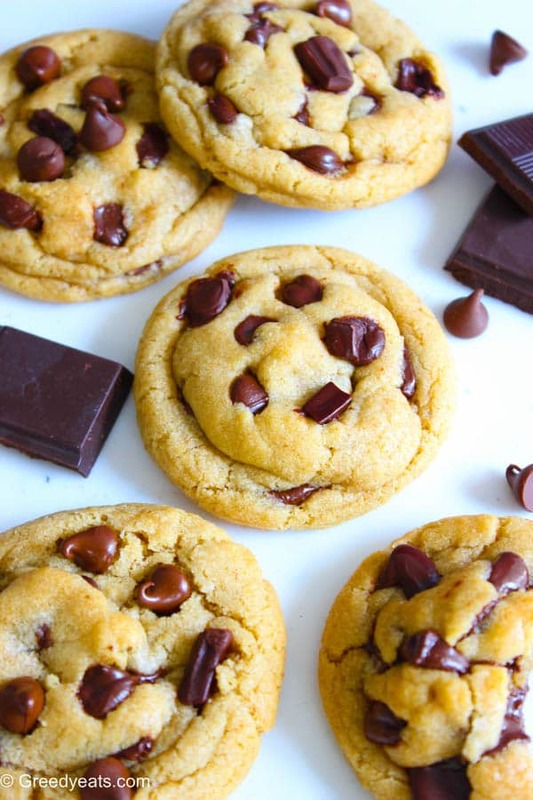 You can always press more after the cookies are baked. 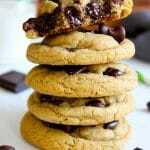 I simply love how thick and puffy these chocolate chip cookies bake. And the fact that no one can ever guess these are vegan, makes them the best vegan chocolate chip cookies ever known! 1. Mix your ground flax-seed in water and set it aside to form flax egg. 2. Beat softened butter for a minute or so and add brown sugar to it. Beat this mixture till it turns very light and fluffy. About 2-3 minutes, using a hand mixer or balloon whisk. 3. Preheat your oven to 350 deg F and line a cookie sheet with silicon mat or parchment paper and set it aside. 4. Add both extracts and flax egg (strain if required) to the butter mixture. Mix well to combine. 5. Sift your flour, baking soda and cornstarch over this mix and fold just until flour disappears into the dough. Fold in the chocolate chips and chocolate chunks (if using) saving a few to press on top. 6. Form 5 cookie balls. About 3 tablespoons each. Roll them tall, about 2-2.5 inches in height. 7. 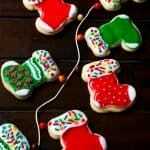 Place mounts on your cookie sheet and stick the sheet in freezer until these mounts are firm to touch. About 5 minutes. 8. Bake the cookies for 13-15 minutes. They will still appear very soft in the center. But the cookies will continue to firm on cookie sheet as they cool. Don't over bake them. 9. Let them cool on the sheet for 5-7 minutes. While the cookies are cooling, you can press those saved chocolate chips and chunks on top of each cookie. Transfer on a wire rack to cool down further. Enjoy warm! 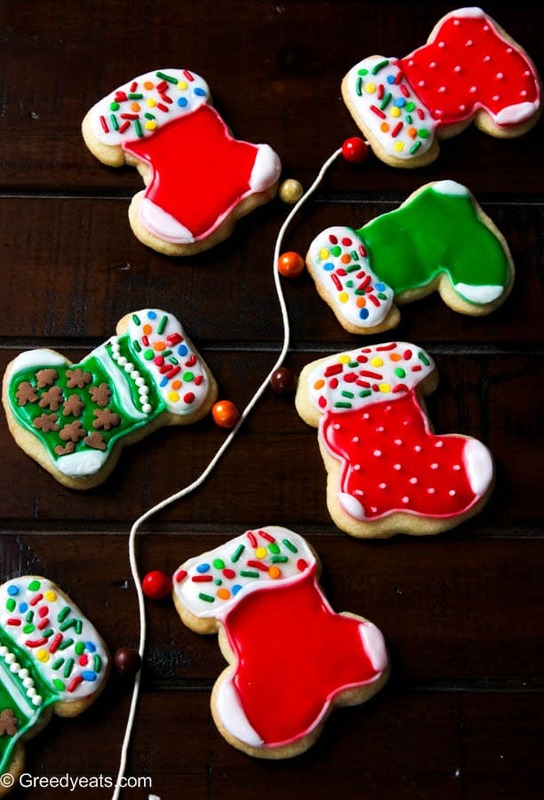 Cookies stay fresh at room temperature, covered tightly for 4-5 days. 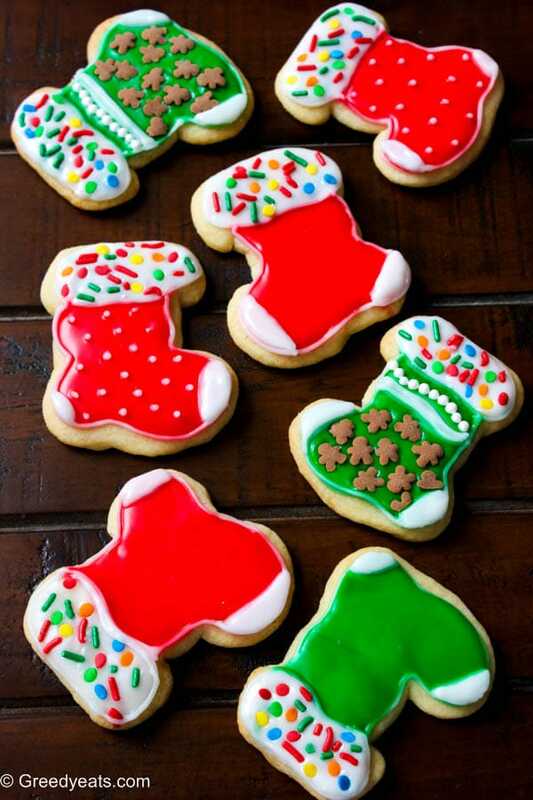 Both baked and unbaked cookies can be frozen for upto 2 months in the freezer. To freeze unbaked cookie mounts: form balls and store them in a ziploc. Bake for an extra minute, no need to thaw these mounts. 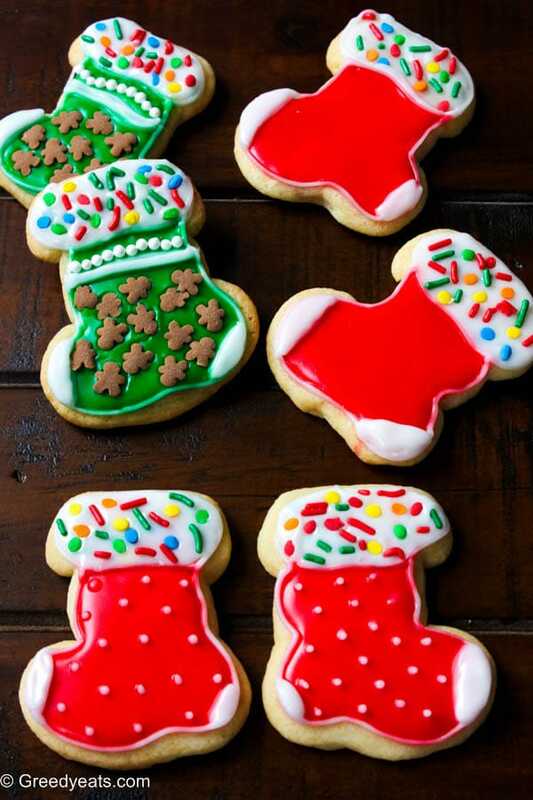 These are pretty large cookies, if you wish to bake them smaller, you may from 8 balls out of the dough. Baking time in this case would be somewhere around 10-11 minutes. 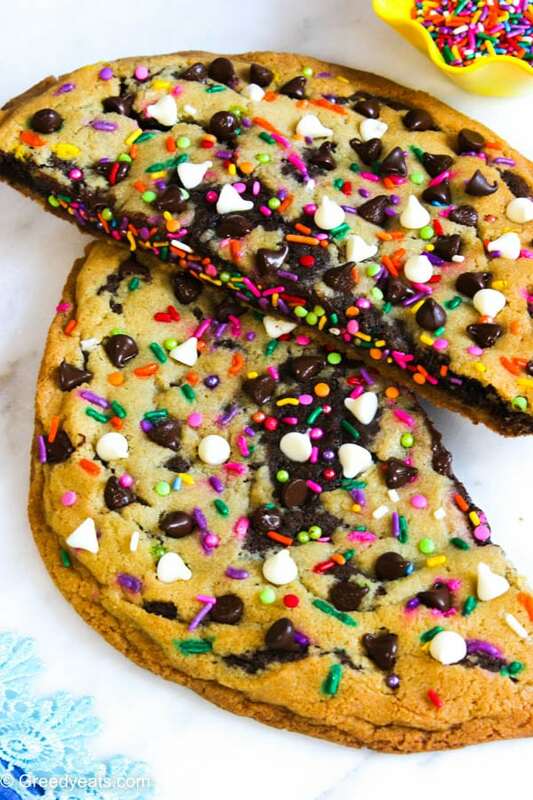 One giant birthday cookie recipe filled with chocolate chips, stuffed with fudgy brownie and sprinkles. 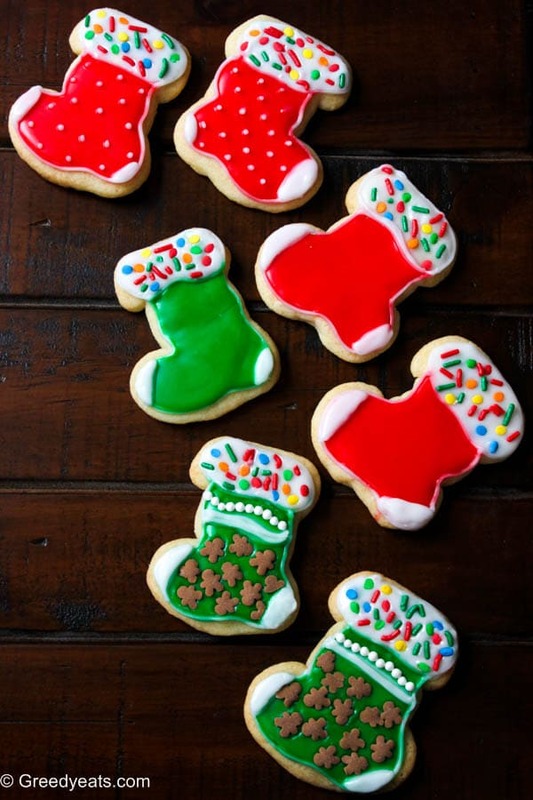 The only giant cookie recipe you will need! Skip that sugary coffee crumb cake from bakery this weekend and bake your own. A coffee cake that is so buttery yet very moist and light! Super moist and buttery vanilla bundt cake with flavorsome berry swirls inside. The cake is topped with gooey vanilla icing!